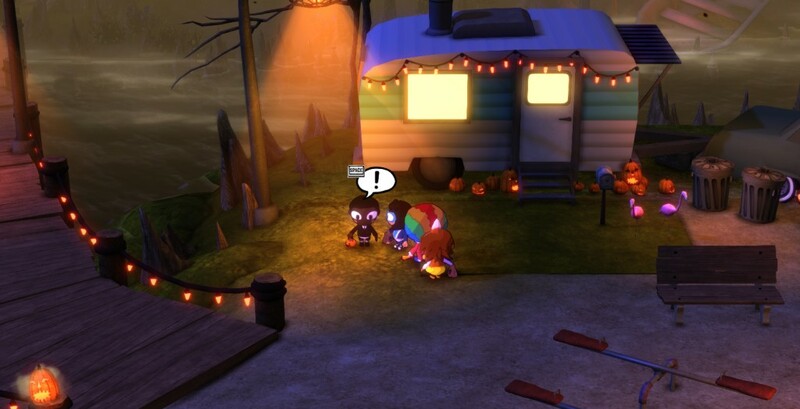 Costume Quest 2 created by Midnight City. - Back to them thar witches. Head left from Monty’s Gator Giddyup and you’ll find a stubborn gator. Swap to the Clown costume and use the Squeaky Horn to get the thing out of your way. - Just beyond is the appropriately-named Lil’ Bones, who insists you go Trick-or-Treating for him. Fair enough. There are eighteen houses in the area, and you need to hit them all up before you can borrow his boat. Some contain enemies; some contain friendly adults who will give you lots of Candy. The first three houses up and to the left of where you meet Lil’ Bones contain, from right to left, two sets of enemies and one Candy house. If you walk around the rear of the left-most house you can drop onto a nearby boat, where a chest awaits. It contains the Dino Slippers costume material. You'll need this to progress through the area ahead, so best you nab it now. The next two houses are to the left and down of the first. The first house is friendly; the second is a bit decrepit (though if you look around the side you’ll find a path to a pinata); the third is a battle. The third batch of houses is south and east of here, not far from a save point. The first and second are unfriendly (though you can walk beside the first house and up a ramp to find a pinata); the third has Candy for you. The fourth batch of houses is to the east of the last batch, near a small playground. The first house is safe; the second is safe; the third is a battle. - That’s not all of the houses, but we’ll find the rest in a bit. First, have a look around the playground. The boy beside the house nearest the bridge, a studious fellow named Baron, will ask you to invest 200 Candies. This unlocks the quest Investing in the Future, which continues in, duh, The Future. In the centre of the playground is a boy who wants a Ghost Munch Creepy Treats Card, and if you can give him one (more than likely you can, if you came here last and got in lots of fights) he’ll give you a Bubble Barf card. - While you’re here, check one of the two save points. There’s a side quest waiting, Bayou Hide n’ Seek. It will send you all over the Bayou, searching for kids who have gone into hiding. We’ll look at this side quest in another article. - While battling you’re also going to hit level three on your characters, which will give you a new quest, Corvus’ Combos. If you go speak to Corvus again in The Future he’ll teach you how to use Combos, allowing you to get in an extra hit whenever you land at least an OK hit. Quite handy. - Take one of the two exits away from ‘town’, either in the north or the south. Both ultimately lead to the same place, and both have battles along the way. - To the east of Shady is a boy on a log who will give you the Duelo del Diablo quest. Approach him with the Clown outfit on your lead character and you'll receive the Pterodactyl costume pattern. To the right of this kid you’ll find a side path leading to a sleeping croc; if you use your Clown Horn on it you’ll scare the croc away from a chest containing Greenish Yellow Fabric costume material. - You’ve almost reached a new subsection of Backwater Bayou known as the French Quarter. Before going there, however, check out the left side of the path. There’s a lone house here that is apparently empty. Go up the ramp beside the door, however, and you can drop down into the side yard. Here you’ll find a chest containing the Fudge Crystals card. You can then speed boost out of the yard and back to the path. - Once you have the Pterodactyl costume, head northeast around Monty's croc pen. A pile of leaves blocks your way to a chest. Blow 'em away, then pop open the chest for a Sugar Droppings card.